The anzu-iro, it is the soft orange, such as the fruit of ripe apricots. 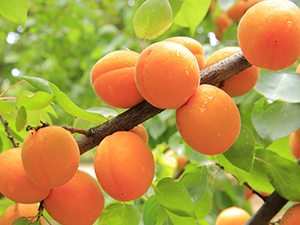 Apricot is closely related species of plum and plum in the deciduous Odaka tree of Rosaceae Prunus. I’ve been cultivated since ancient times in Japan, it was harvested in order to use is in the seed rather than because it is eating the flesh “Kyounin” as a herbal medicine. You also seen its name to the Heian period is referred to as a “Karamomo” “Kokinwakashu”. “Afukara also thing if Omoe some time that Wakaren Naho what Kanashikere” (Kokinwakashu). However, “Anzu” is “apricot color” is transmitted it from being Japanese translation in the Meiji era became the color name. It is rare to be a color name the color of the fruit since ancient times in Japan, many of the color of the flower has become a color name. By the way, apricot flowers pale pale pink. In the West to reverse is almost the color of the fruit is the color name, the color of the fruit does not leak to the apricot color also cases that have been in the original. There is a “Biwa-iro” in color that is similar to apricot color, but the color name that has resulted from again become modern.